We welcome Audun from Germany for his AFF Course in Spain. 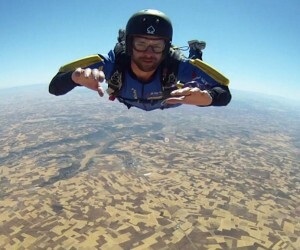 Audun spent two weeks near Madrid going for skydiving every day. Besides completing his AFF training, Audun also managed to get his A-license and about 30 jumps done and signed in his logbook. It was a successful trip for him and he enjoyed his new hobby! Well done, Audun! Congratulations from us all!